WASHINGTON, D.C.—House Republican Whip Steve Scalise (R-La.) joined fellow Republican leaders to deliver remarks on President Trump’s State of the Union address. 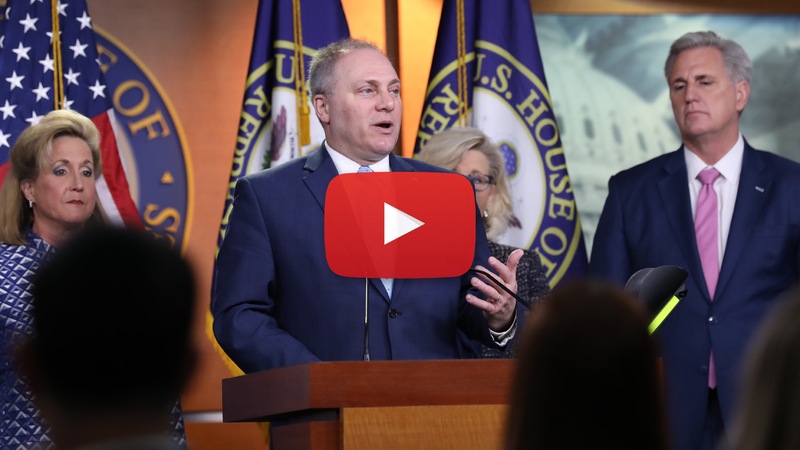 Whip Scalise highlighted the important policy messages the President delivered, especially the urgent need to solve the border crisis as Congress approaches another funding deadline. He then discussed the President’s call for Congress to protect the unborn. Whip Scalise has joined with Rep. Ann Wagner (R-Mo.) to ensure her Born Alive legislation receives a vote in the U.S. House of Representatives by filing a resolution that will allow a discharge petition to be filed in the next 30 legislative days. “We’re in the middle of negotiations over how to secure our border. Our experts, months ago, put together a plan. The people who risk their lives to keep our country safe laid out a plan of what it’s going to take to secure our border and what it’s going to cost. The President presented that months ago and in December, right before a government shutdown, the House passed a bill to properly fund it. It never made it to the President’s desk and then ultimately we had a government shutdown. “The President talked importantly about how we need to secure the border and it’s not just about technology. Clearly, that’s a part of it and points of entry security, more border patrol agents. It also involves making sure we have physical barriers to protect this country and that includes a wall. All of that needs to be part of a final solution. “I want to applaud my colleague and friend Ann Wagner for her leadership in bringing legislation forward as the President talked about last night to prohibit any procedure that would allow for the killing of a baby once it is born. “This legislation, the Born Alive bill, will give protection to those people who can’t protect themselves. If you’re pro-life or pro-choice, we should all agree that the baby should have the same protections as everyone else. That’s what the bill does. “We’ve worked together to have a rule that I am filing today to bring that bill to the floor for a vote and ultimately to have a discharge petition where everyone can go on record. Every member of Congress should stand up and be counted on this important issue of defending life.